Why is my Baby Waking Up at Night When She Used to Sleep Well? 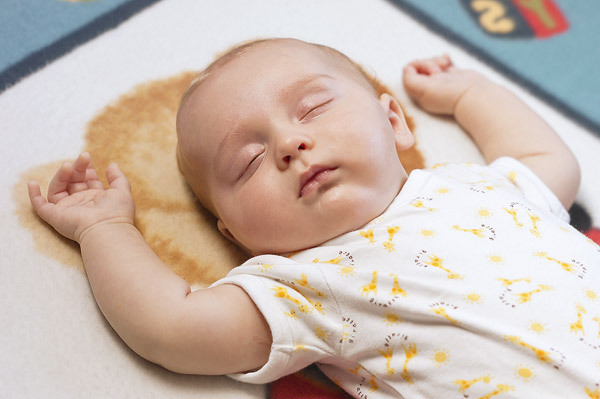 One of the biggest myths about infant sleep is that it steadily and consistently improves – babies start to sleep for longer and longer stretches until finally they make it through the night and you're done. Right? Not exactly true. Of course some little ones do cross the all-night-long threshold and stay there, but for many babies, the road to a full night's sleep is bumpy, and full of detours and setbacks. To begin with, between the ages of three and six months, infants make big cognitive leaps — you can see during the day that they are more engaged and aware of the world. No doubt it's adorable, but it can translate into fitful or broken sleep (even for a baby who used to blissfully cruise through until morning), because their brains are excited and active. Most babies are also sensitive to changes in their bodies and the environment. So a new motor skill (like crawling and pulling up), or teething pain can mean everyone is awake in the wee hours. If you have a visitor, or you're traveling, expect your little “pattern detector” to change their habits as well. So what can you do? It might help to think about it this way…as a parent, you can't make your baby sleep. Instead, your job is to provide as consistent a routine and set of expectations as you can for your baby and avoid changing your techniques too often and eventually your baby will follow those patterns or routines. If your baby doesn't need to eat at night anymore, try doing the minimum necessary to sooth her when he or she wakes. Enter the room quietly, leaving the lights down, and silently put the pacifier in their mouth, try rubbing their back, or making shushing noises, and then leave again silently. Falling asleep alone is a learned skill – and we eventually just have to step back while our kids practice. Remember that every baby has to find her own unique way to fall asleep – some babies rock back and forth, others crouch face down and tuck knees and hands under their bellies, and some need an animal, pacifier, or lovey to self-sooth. The older they get, the more coordination infants have to get into these positions to sleep. This is good news for parents, because while a three-month-old has little motor control, by nine months most babies can move, flip, and tuck on their own. And as these motor skills increase, they translate into more slumber for the entire family.